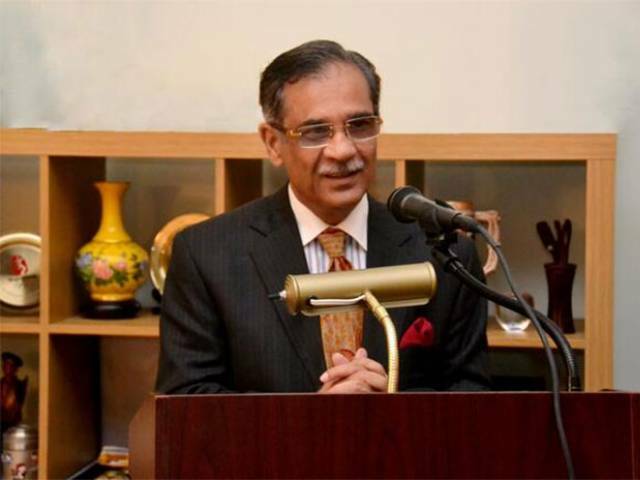 KARACHI: Chief Justice of Pakistan (CJP) Mian Saqib Nisar on Saturday will chair a meeting on judicial reforms in the Supreme Court (SC), which will be attended by chief justices of all four high courts. The meeting— to be held in the Supreme Court’s Karachi registry— will deliberate upon different ways and strategies to bring reforms, innovation and improvements to the smooth functioning of the current judicial system. The forum will also deliberate upon different aspects to make Law & Justice Commission an effective body; strengthening organisational capacities and accountability to be effectively responsive to citizens’ security and justice needs, and empowerment of citizens to assert their rights and claim their entitlements and exercise their duties and obligations. In another meeting of the judicial reforms committee held on Thursday in the Supreme Court’s Islamabad registry was attended Justice Nisar, Chief Justice Lahore High Court Justice Mansoor Ali Shah and other officials. Chief Justice Mian Saqib Nisar chaired a meeting to review the judicial reforms in Supreme Court. In the meeting, CJ Justice Syed Mansoor Ali Shah briefed the CJP on the judicial reforms in Punjab’s judiciary. LHC CJ Mansoor Ali Shah gave an overview of reforms recently brought in Punjab judiciary, especially in terms of delay reduction, minimisation of backlog; e-facilitations to public litigants and lawyers to ensure easy access to the courts; introduction of Information Technology; effective court and case management; promotion of ADRs (Alternate Dispute Resolution); training of judges, law officers and staff among others, to provide inexpensive and expeditious justice to the masses. The chief justice praised the recent reforms in Punjab, saying that these will be treated as a roadmap for rest of the judiciary. The meeting was attended by LHC CJ Mansoor Ali Shah, officers of the Supreme Court, LHC and Law & Justice Commission of Pakistan. CJP Nisar has also constituted benches in the apex court for a period of one month as a part of judicial reforms to ensure expeditious disposal of cases. Moreover, on every Friday two-member special benches will hear the fresh petitions and which are being filed in large numbers.